Often misunderstood, Reginald Hawkins was one of North Carolina's most significant leaders of the Civil Rights Era. Image courtesy of the North Carolina Office of Archives and History, Raleigh, NC. Reginald Hawkins was as an obstreperous and often confrontational desegregation activist of the 1950s and 60s. His passionate avocation for racial equality propelled him to the national civil rights spotlight and helped to dismantle segregation in North Carolina and the South. In 1968, Hawkins ran on the Democratic ticket in the North Carolina gubernatorial election making him the first African American to run for a Southern statewide office since Reconstruction. He was also an ordained minister. Though misunderstood, nearly forgotten, and labeled by some as, “militant,” Hawkins’s endeavors to end racial injustices and his ability to inspire others to join the cause place him as one of North Carolina’s most significant leaders of the Civil Rights Era. Following his studies at Howard University, Hawkins opened a dental practice and dedicated himself to civil rights. Wanting to actively participate in desegregation, Hawkins joined the Charlotte chapter of the NAACP to work alongside Kelly Alexander, a man whose leadership helped lay the foundation for the landmark ruling in Swann v. Charlotte-Mecklenburg Board of Education (1971). During the Korean Conflict, Hawkins’s pursuits were interrupted when he was drafted into the U.S. Army to serve as a dentist at Fort Bragg, North Carolina. After Hawkins’s return, he learned that NAACP leaders disagreed strongly regarding protest strategies–in particular, the means to end school segregation. Kelly Alexander favored suing the city of Charlotte over civil injustices–a method that was often interminable, if successful at all. Hawkins, on the other hand, desired a confrontational approach that used media coverage to highlight injustices so that discontented black Charlotteans might be mobilized and abrupt, immediate change might be realized. White and black political leaders, including some fellow NAACP members, criticized Hawkins’s approach, yet he argued, “The only way to move forward is to engage bigots in direct controversy within their own community.” The most powerful and significant example of this method arose when Hawkins escorted Dorothy Counts, a young black girl, to a non-integrated Harding High School in Charlotte. National and international press witnessed Counts walk to school in a “shower of spittle, pebbles, [and] sticks,” recalled Hawkins, who had stood next to Dorothy. A minimal police presence compounded the confrontation. Coming several weeks before Little Rock, the white reaction to Dorothy Counts’s enrollment revealed the entrenched segregated nature of North Carolina. The event, according to one historian, was a “watershed” moment for Hawkins that granted him tremendous political capital. Hawkins resigned from the NAACP in 1958 and created the Mecklenburg Organization for Political Affairs, or MOPA. MOPA was a manifestation of Hawkins’s leadership style and an entity to mobilize blacks irate with segregation. It was also a way for Hawkins to separate the civil rights movement in North Carolina from the NAACP, a group that was increasingly being labeled as “communist.” MOPA’s grassroots organization used community activists (usually African American) to call for desegregation. These activists participated in marches, picketing, protests, boycotts, and sit-ins and focused mostly on segregated schools and hospitals in Mecklenburg County. Hawkins’s activism cemented him as a leading civil rights activist in Charlotte but also earned him a nefarious reputation. Charlotte Mayor Brookshire labeled Hawkins as “belligerent” and his actions an attempt at “coercion.” Even some black members of the community urged Hawkins’s actions were imprudent and impatient, yet Hawkins refused to subside. Hawkins once exclaimed: “I have no intention of stopping my people’s fight for equal rights.” While this angered political leaders, especially white ones, it inspired many everyday black citizens who wanted change outside the legal process of lawsuits to participate in combating segregation. 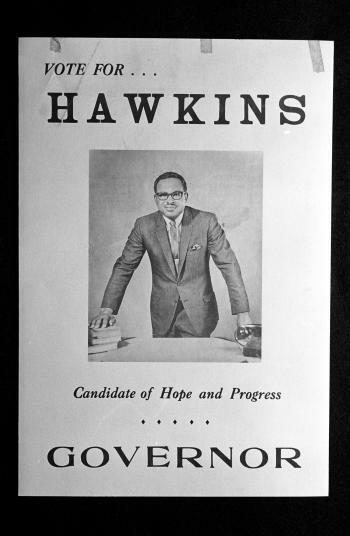 In 1968, Hawkins made a bid for the North Carolina governorship. Garnering enough support for his campaign was a problem for Hawkins as his actions as head of the MOPA proved to be a double-edged sword. Although they helped elevate his status as a political figure, they fostered many enemies. Hawkins lost the election to a white Republican. With the same result, he ran for governor in 1971. Nonetheless, Hawkins’s campaigns were significant political symbols for blacks, especially in the South, of the power of political activism for the African American population. Although some have considered Hawkins one-dimensional or even a former impediment to African-American equality, his efforts helped raise and mobilize black political consciousness in North Carolina and the United States. Though often eclipsed by Martin Luther King, Jr., and Malcom X, Hawkins’s efforts were invaluable in desegregating Charlotte and the South. Reginald Hawkins died September 10, 2007 in Charlotte, North Carolina.